Quick and simple yet tasty. Frozen sweet paste shell, caramel filling can and fresh pears, peeled, halved, cored and poached in cinnamon anise stock syrup. 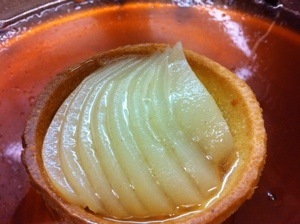 Bake tarts, spoon in caramel, slice pears into half again and slice length ways and fan out onto the tarts. Brush with the stock syrup once it has been reduced to almost toffee.